Subic Ocean Adventure Photos, where the jungle meets the ocean. 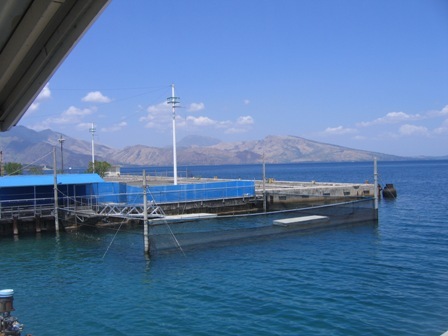 I have put together the following Subic Ocean Adventure Photos for your enjoyment. Even though photos are good to get an idea of what to expect, nothing beats actually being there and seeing first hand what the Subic Ocean Adventure Park is like. You will have a lot of fun there, like everything keep an open mind and enjoy, kids especially will have a great time. These photos are a walk through of the Ocean Adventure Park. 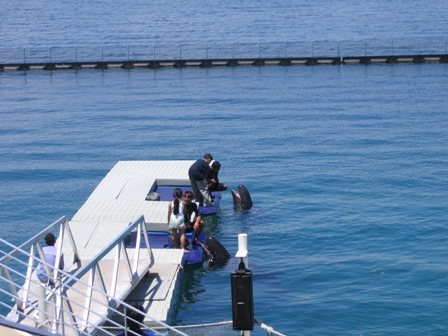 The centre pen, as shown in the photo above, is where they train the False Killer Whales. The trainers spend hours upon hours with the animals fine tuning the commands and signals. The work has paid off because the show is of high quality. Mind you a job as an animal trainer would be pretty fantastic, you could hardly call it work, I would swap their office for mine any day. 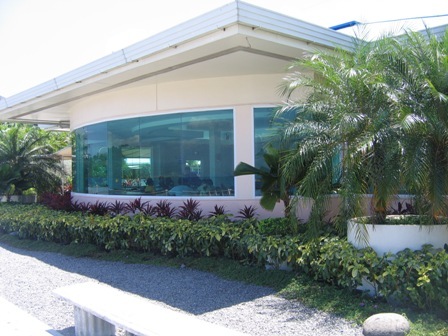 Directly outside the Ilinan Bay Cafe are two small pens with a variety of marine creatures. You will find a number of Black Tip Reef Sharks, the same as in the photos above, there as well as an assortment of other fish. The fish in these pens all appear to be larger schooling fish, barracudas, trevally and I'm sure I saw a tuna as well. The Ilinan Bay Cafe views directly onto the training area for the False Killer Whales, if you are lucky you may catch a glimpse of the trainers in action from the luxury of air-conditioned comfort. The food here was not very special, typical fast food with quick preparation. One thing to remember is that you are not allowed to bring your own food into the Ocean Adventure Park. The reason they give as they do not want you to feed the animals, are you really going to get that close to the False Killer Whales and Sea Lion to actually feed them? I think not. I'm sure they really want you to buy their food. The Seal Lions live at the opposite side of the Park to the False Killer Whales. In the photo above you will see the pen where they have some Sea Lion time or a swim without the restrains of training. You cannot see from this photo but towards the left of the pens are the individual land based cages which house the Sea Lions. You can walk right the way around to the pen and watch them swim effortlessly through the water. 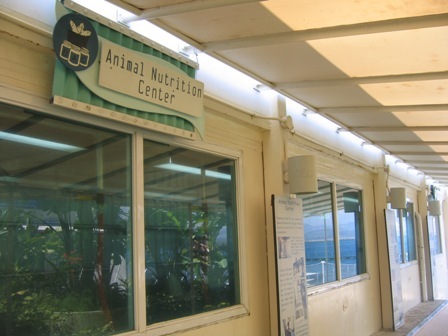 It is here in the Animal Nutrition Center that the food allowances for the Sea Lions and False Killer Whales are calculated. Frozen fish arrives frozen in boxes. Each afternoon fish to be consumed the next day is taken out of the freezer and slowly defrosted overnight The fish are then weighed and placed in a designated bucket for each animals consumption. Each animal has it's own diet, which can vary from mackerel, herring, sardines and squid. The amount of food consumed is determined by it's weight and activity levels. The False Killer Whales are without a doubt the star of the show. They are about 7-8 metres in length and do an assortment of entertaining jumps, spins and splashes! The standout trick is when the Whales push there trainers under the water and then shoot them up and out of the water so they are flying through the air, quite spectacular, always raises ohhs and ahhs from the crowd. 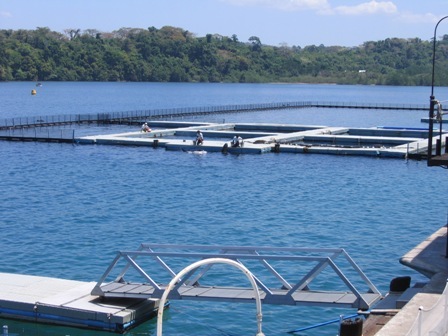 For more information on the Ocean Adventure Park in Subic Bay, have a look here. and for information on where Subic Bay is and how to get there have a look here.